This visually stunning book focuses on the rebirth of Chinese art in the twentieth century under the influence of Western art and culture. 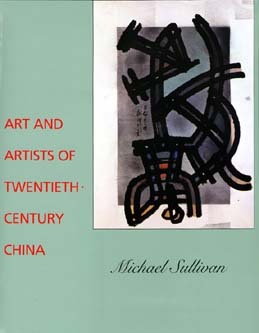 Michael Sullivan, recognized throughout the world as a leading scholar of Chinese art, vividly documents the conflicting pulls of traditional and Western values on Chinese art and provides 364 illustrations, in color and black-and-white, to show the great range of artistic expression and the historical processes that occurred within various movements. A substantial biographical index of twentieth-century Chinese artists is a valuable addition to the text. Sullivan discusses artists and their work against China's background of oppression and relaxation, despair and hope. He expertly conveys the diverse and at times bizarre intertwining of Chinese cultural history and art during this century. Included are the intense debates between traditionalists and reformers, the creation of the first art schools, and the birth of the idea—shocking in ethnocentric China—that art is a world language that obliterates all frontiers. The scholarly traditions of classical Chinese painting, the belated discovery of Western modernism, the artistic upheaval under Communism, and China's rethinking of the very nature of art all have a place in Sullivan's fascinating history. Michael Sullivan has known many of the major figures in China's modern art movement of the 1930s and 1940s and has also gained the confidence of younger artists who rose to prominence following the 1979 "Peking Spring." This long-awaited book—richly documented and abundantly illustrated—is a capstone to Sullivan's work and will be enthusiastically welcomed by art lovers everywhere. Michael Sullivan lives in Oxford, England, where he is Fellow Emeritus of St. Catherine's College, Oxford University. His earlier books published by California include The Arts of China (third edition, 1984) and The Meeting of Eastern and Western Art (1989).